We have a few strategies to graduate WritingSE out of beta status. I am trying to catch up on the issues (so this is probably naive), Do I understand correctly that the main issue is that we are not hitting 10 questions a day? I PROPOSE we tackle the issue head-on by creating good questions. Questions that will provoke varied answers – so less "Is it ok to…" which the answer is always the same: "You are the author, write what you want." Instead we need some questions where people will disagree or be forced to draw from their own experience. We need questions where we honestly don't know how we feel. I know writing is personal, and our sensitive stuff is not open to debate from the peanut gallery – but that doesn't mean we can't ask less personal questions that we know will generate some heat. Questions that will get on the Hot List – double-edged sword because I can sometimes guage in advance which questions will be HotListed (maybe from lack of competition), but Hot List also comes with the typical "hot take" answers that are useless MAGA-rants by 1-time posters who only signed up to parrot their Fox News moment. For this reason I actually withhold personal questions when I anticipate they could end up on the Hot List. (I have mixed feelings about the Hot List just admitting my own hypocrisy here). I don't pretend to know the mechanisms of HLN, but it is clearly a way to promote WritingSE within the SE-userbase. It's advertising. Let's use it. Controversial questions with a good title get on the Hot List. They don't need to be personal questions, they can be designed for the Hot List – as Writers, we should be rockin' the Hot List because we should understand how to write an eye-grabbing lede. Questions that go deeper – we are all writers who are writing, right? We are solving issues everytime we sit to write, so we should share some of these deeper questions. I know, we often have the view of our esoteric questions not being for general interest, but the result is we only have shallow beginner questions by unsure writers who are just finding their voice. That leaves nothing to aspire to on the front page. We look like a website for amateurs and students – nothing wrong with that, but we should step up, and represent the more seasoned writer too. My saddest moment on this site was when Mark Baker left. He said it was because he was answering the same simplistic questions over and over. We need to admit how boring we are, and try harder as writers to keep the front page engaging and active. We need to hit 10 questions a day, so for [insert deity]'s sake please stop and consider if it is really necessary to VTC when you really ought to downvote or just move along and do something constructive. We have a lot of beginner questions right now that are frankly depressing. We have lost users because the gatekeeping has been in overdrive. Do NOT make up excuses to vote to close, this is apparently THE reason we are in beta (assuming closed questions do not count towards the 10/day). I'm not saying keep truly offtopic and repeat questions, just curb the urge to gatekeep. If it is a "maybe" just leave it alone. How would this proposal work? I suggest we each make a personal pledge to ask more questions. I don't say how many, or even set the goal of a number per day to match the quota. We benefit by better questions that generate multiple answers, period. 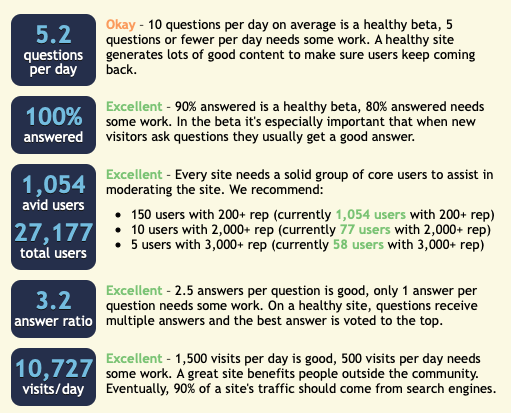 Better questions will lead to more engagement, which will lead to more active users asking questions. The objective is to "prime the pump". Ask Hot List-worthy questions, even if they are not for your personal writing. Ask the esoteric questions too, even if you don't expect a worthy answer. Ask controversial questions that will generate heat (feel free to ignore the discussion). If the questions on the front page are uninspiring, ask something better. Keep a list of Hot List topics to pool from, to ask on a rainy day. Ask questions that you know the answer, and answer them. Ask questions that are too hard to answer, maybe you'll be surprised. Ignore "hold my hand" questions and the low-hanging fruit of over-cautious beginners. Leave them for new users to answer who aren't here 24-7. Let them find a community of other beginners, rather than face a "panel of experts". Ask about topics outside your "zone of influence", this is where the magic will happen. We get very much in a rut of one-type of story, THE story that has the same awesomeguy and the cliché derivative same-same-plot. YAWN. There are other kinds of writing, and I'm sure you have other influences. Pick something you are NOT an expert on and ask a question. A confluence of input can lead to inspiration and unexpected insight. This is no more than a hypothesis, but I wonder if at the moment people are sort of holding on to questions, because there was going to be a contest, so "maybe it's worthwhile to keep the question until it can be entered into the contest". I am sort of at fault here - I got into the whole "let's make sure the tags that participate in the contest are in fact clear enough", but I do notice that we rose from 4 to 7 questions/week, and then started falling back. I do agree re: let's broaden our scope. We have a journalism tag that we haven't tapped into at all. And there's other writing: speeches, letters, blogs, I don't know what else. If we start asking questions about those, it could start those wheels turning, drawing more people here, and more questions. Not the answer you're looking for? Browse other questions tagged discussion weekly-topic-challenge topic-challenge-proposal .